"Nice change to eat at a barbecue. Crispy seasoned sausages with a nice flavor. Eat in a pita with chopped tomato, parsley, onion, cucumber, and tahini. Add plenty of lemon. Yummy." In a medium bowl, mix together the ground pork, onion, parsley, salt and pepper. Fill a bowl with warm water, and add the vinegar. Dip the caul fat into the water, and keep submerged for 1 minute to wash. Rinse in cold water. Carefully open up the caul fat on a clean work surface, and cut into 4 inch (10 cm) squares. Place a small compressed handful of the sausage near the edge of one square. Fold the sides over, and roll up firmly. Repeat with remaining meat and fat until you have about 10 sausages. Prepare a charcoal grill for high heat. Place sausages onto skewers. Grill the sausages for 20 minutes, turning frequently until the outside is crispy and dark, and the inside is no longer pink. 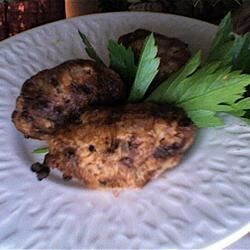 This is a really good, traditional recipe of Cyprus. In addition to the listed ingredients, I also use cumin (1 tablespoon), which makes the taste even better. Our Greek community of friends regularly enjoy sheftalia. This photo was from the ones we cooked while camping at the beach. They are delicious when grilled over mesquite wood! Great recipe! Easy and fast. Makes a great side dish or, along with french fries and a salad, a light meal. Wonderfull recipe, I´m cooked without caul fat and was flavor full, I add some mint leaves chopped!